The poor people in Pakistan can be provided monthly food free of cost !! This article provides a road map for quick alleviation of poverty from Pakistan. Eventually this model will be followed by any new government from the Islamist who will lack expertise knowledge in financial and economical systems, yet will be able to alleviate poverty in just 3 years time. This will happen by the virtue of the sincerity to the cause and their ability to immediately put to justice, the corrupt political elite and to materialize actions without getting blackmailed. The rich and upper middle class mostly lives in urban cities and usually are covered under the existing tax-net system and their businesses can be fully documented. the annual collection of zakat @ 2.5% can be enforced easily because of the ‘Religious Factor’ involved. Currently, all the banks in Pakistan are obliged to deduct the zakkat automatically. The collection of zakkat and its distribution should be carefully watched and given under the management of highly trustworthy team of honorable nationals. The additional money can be generated through the investment of the public money in the swiss accounts. The amount of Zakat to be paid by an individual depends on the amount of wealth, and the type of assets the individual possesses. The Quran does not provide specific guidelines on which types of wealth are taxable under the zakat, nor does it specify percentages to be given. The amount of zakat to be paid on capital assets (e.g. money) is 2.5% (1/40). Zakat is additionally payable on agricultural goods, precious metals,minerals, and livestock at a rate varying between 2.5 (1/40) and 20 percent, depending on the type of goods. Zakat is separate from the practicekhums, where Shi’ites are additionally expected to pay one fifth of their income. Zakat is only payable on assets continuously owned over one lunar year that are in excess of the nisab, a minimum monetary value. The nisab is calculated after adding the cash value of zakatable assets (gold, silver, cash, stocks, merchandise for business, livestock etc.). Personal assets such as clothing, household furniture, one residence etc. are not considered zakatable assets. The nisab for gold and other money is the value of 85 grams of gold at world prices. Thus, at 2012 prices, the nisab for such assets was USD $ 5,200. From the chart (Table 1 – Investment behavior), we assume that currently in 2012, the total investment is just 5% of the GDP. Because of the law and order situation. Worth noting that the charity donation in the developed countries (USA, UK and CANADA) is well below 2.5%. Note: More money will be available for medicines and transportation if these kids are admitted for free primary education at islamic madressahs. No Pakistani will die of hunger and no Pakistani will be seen begging on the roads ! The zakat is considered by Muslims to be an act of piety through which one expresses concern for the well-being of fellow Muslims, as well as preserving social harmony between the wealthy and the poor. Zakat promotes a more equitable redistribution of wealth, and fosters a sense of solidarity amongst members of the Ummah. 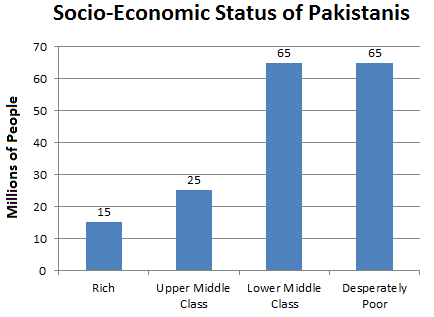 Is the middle class that big in Pakistan?